The Southern Comfort Conference takes place this week in Atlanta. I seriously considered attending, but after weighing all the costs, I decided not to go. The transportation expenses broke the camel's back. It is nearly 2000 miles roundtrip. Driving would be less expensive than flying, but driving would take a lot longer. Since this girl does not travel lightly, the expense of flying would be burdened with the added cost of whatever the airline charges for luggage. And if I wanted to get around Atlanta, a car rental would be an additional burden. Also, as I wrote here last month, "my girl mode and boy mode must take separate vacations because my spouse does not want to vacation with my girl mode. I have no problem with that, but two vacations are not usually in the cards financially" especially if one is as expensive as the Atlanta trip likely would have been. I was very disappointed about not going to Atlanta, but I accepted the financial realities and moved on. Last week, my wife indicated that she does not want to go away on vacation this year because of some family health issues. She is ok with day trips, but does not want to take any extended trips away from home. That freed up a lot of vacation funds, so I began thinking about how to spend it. It was too late for Atlanta, but Fantasia Fair is a month away. A lot of my friends are going to Fantasia Fair this year, I need a vacation, and most importantly, I need to spend some extended time as a woman again, so I thought about attending Fantasia Fair this past weekend. Traveling to Provincetown on Cape Cod (the site of Fantasia Fair) is a piece of cake. Pack the car, drive four hours and I am there. The only hitch might be getting a room at this late date, but when I contacted the Bed and Breakfast where I stayed last time, they had one room left, so I grabbed it. I registered for the event yesterday and now I just have to count the days until I will be able live as the woman I am full-time for a full week. Hey Girl --- New England in Autumn verse Hot-Lanta in Sept, as a New Englander I proudly cheer you choice. So much fun so many girls, great weather, and great clothes!!! Who says we trannies never catch a break? I normally travel by train but because I sometimes get busted, I'm usually in boy-mode wearing my feminine intimates underneath! 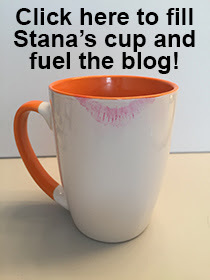 So very good for you, Stana! I'm sure you'll have a wonderful time. ps; looking very womanly in 2010! You go, girl! I love going to p-town; used to rent a place in wellfleet and couldn't wait to go there for the fum and enjoy the activities. I'm sure you'll have a great time; especially if you go out wearing delightful dresses such as this one! you look ultra-feminine and ready for a wonderful evening out!